I’m just dropping you an email to say a huge thank you for the amazing job you did of the marquee for my Midsummer Nights Dream 21st Party. It looked absolutely amazing, and helped make my party a fantastic night. Thank you so much for all you did to make our party such a success. The marquee was fantastic. As one guest said when they arrived in awe and wonder, it was bigger than Paddington station from whence they had just come! It looked fabulous. And it held up! There were moments when I felt sorry for the scaffolding as 300 dancers tested it to the full! But connecting to the lake really made the difference and without your inspiration we would have not been able to do this. The heliosphere was incredible as it floated over the lake and joined everyone on the decking.  Your tailor made, everything is possible approach sets Good Intents apart from the other marquee companies who provide a standard more commoditised approach. Herefordshire is lucky to have such a supplier. I just wanted to write and say a huge thank you for your huge contribution in making party such a success – they were over the moon with the party – they couldn’t have been happier. Your team were a joy to work with and Bruce’s cheeriness, enthusiasm and “can do” attitude was much appreciated throughout the build. I will most definitely be recommending you for future events as I would love to work with you again – similarly if anyone enquires about an event planner please do send them my way! Your team worked in gale force winds and driving rain (perfect June weather) remaining good humoured and cheerful despite the conditions. The marquee was perfect, it withstood the conditions in the lead up to the party, and looked resplendent on Saturday evening when to our great fortune the wind dropped and sun shone. 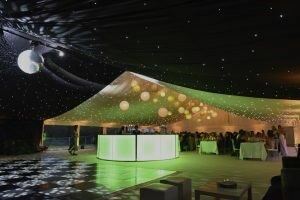 The starlight worked brilliantly with the up lighters, disco ball and lasers.The marquee looked gorgeous both in daylight as everyone arrived, and at night when the party really got going. 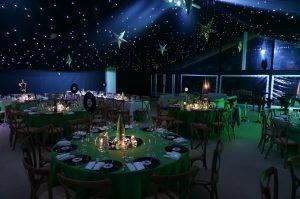 All the tables, chairs, dance floor, stage, fridges etc were great – the loos amazing and much commented on. Your suggestion to light up the house and cedar tree was inspired and certainly added to the drama and impact especially when out friends were leaving. 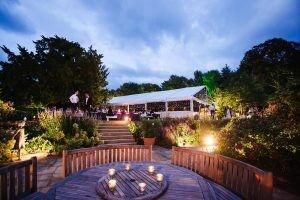 The party was a great success and the marquee much complimented. 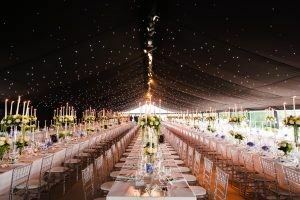 I would certainly use Good Intents for any future party, and would recommend you unreservedly to any friend wanting an approachable professional marquee company in the future.